The decision by German Chancellor Angela Merkel to step down from the party leadership of her Christian Democratic Union (CDU) party has triggered the start of an intense succession battle. As John Ryan explains, Annegret Kramp-Karrenbauer, Jens Spahn, and Friedrich Merz have emerged as three key front runners, with the result set to determine whether the party will continue with Merkel’s centrist policies or shift in a more conservative direction. There are now a total of twelve CDU candidates for the position of leader. The high profile front runners are CDU Secretary General and former Saarland Prime Minister Annegret Kramp-Karrenbauer; Health Minister Jens Spahn, a social conservative who stands for ideological as well as generational change; and Friedrich Merz, another conservative and one of Merkel’s old rivals, who was chairman of the CDU/CSU parliamentary group in the early 2000s but left politics in 2009 after she sidelined him. Annegret Kramp-Karrenbauer, also known as AKK, was Merkel’s choice to become general secretary of the CDU earlier this year. She is reputedly Merkel’s pick for her successor as party leader. She is considered a moderate who would continue Merkel’s centrist policies. AKK announced that she wants to lead a “programmatic renewal” of the party. She certainly finds herself in the right position and with time to do so. Her success will depend on how well she can bring together the party’s different factions. She supports a national minimum wage and quotas for women in companies’ executive boards, and has in the past advocated tax hikes for top earners. During the height of the refugee crisis in 2015, she supported Merkel’s liberal course to keep borders open. When Merkel picked Kramp-Karrenbauer as the party’s general secretary in February 2018, it was seen as an attempt to position AKK for greater things. 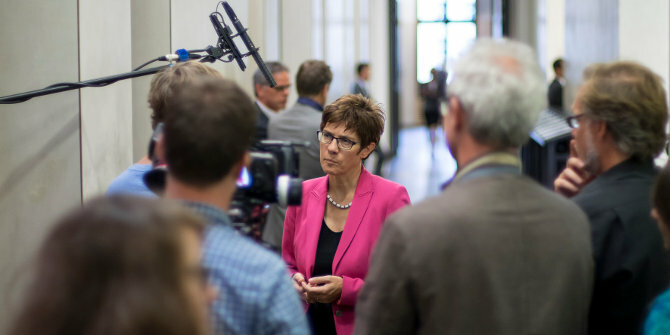 Like Merkel, Kramp-Karrenbauer belongs to the liberal wing of the CDU, but she holds more conservative positions on topics like migration and gay marriage. This could help her to win the support of CDU members across the aisle, even though she is viewed warily as a close Merkel ally. On the other side of the debate, Jens Spahn, at 38 years old, is the youngest of the top contenders. The Health Minister is the most prominent candidate of the conservative wing. He is an outspoken critic of Merkel, but is seen by many as being too young and inexperienced to take on the leadership yet. Spahn, who is openly gay, is popular in the CDU’s conservative wing. He opposes limited dual citizenship for young foreigners, has criticised attempts to loosen laws on advertising abortions and has called for banning the Burqa in public. Spahn has repeatedly voiced opposition to Merkel’s open-door migration policy. He has described Merkel’s failure to control mass migration as “a kind of state failure”. His attacks on Merkel’s moderate course have earned him a following on the right. That backing prompted Merkel to bring him into her cabinet, a move that curbed his criticism and dimmed his profile even if few question that his chancellor-sized ambitions remain. For Merkel, working with Spahn, who has regularly attacked her refugee policies, would be difficult. Merkel tried and failed to prevent Spahn from joining both her Cabinet and the CDU’s leadership committee. That she would be willing to spend the twilight of her political career sharing power with the outspoken Spahn looking over her shoulder seems unlikely. Friedrich Merz, a conventional pro-market liberal and former leader of the CDU/CSU grouping in the Bundestag has been out of frontline politics since leaving the Bundestag in 2009. The 62-year-old announced his intention to replace Merkel within hours of the news that she would be stepping down. Merz reportedly fell out with Merkel after she replaced him as CDU/CSU group leader in 2002. Since leaving politics, he has worked as a corporate lawyer and has taken numerous positions on corporate boards, including as chairman of Blackrock Germany since 2016. In the past, Merz called for a Leitkultur, or dominant national culture. Long before immigration and integration dominated political debate, Merz insisted anyone wanting to live in Germany should “conform to Germany’s prevailing liberal culture”, sparking a furious national debate in which he was accused of illiberalism and racism. Wolfgang Schäuble, elder statesman and veteran former Finance Minister, is a supporter of Merz and has expressed his support for the 62-year-old, who he thinks has the stature and intellect to lead the country. When it comes to successor selection, in addition to Merkel’s backing, geography may also play in Kramp-Karrenbauer’s favour. Both Merz and Spahn are from North Rhine-Westphalia, Germany’s most populous state. In addition, Ralph Brinkhaus, the new head of the parliamentary group, also hails from the state. A party leader from the same state would upend the balance the party has traditionally sought to maintain between the regions. On the other hand, both Merz and Spahn will pitch the idea that they can win back support from the populist Alternative for Germany (AfD) party as they steer the CDU to a post-Merkel conservative position. The three favourites will contest with nine other candidates for the votes of the 1,001 party delegates during the CDU’s annual convention in Hamburg on 7 and 8 December. They have four weeks to persuade CDU delegates they can stop further slippage of votes from the CDU to the AfD and that they can persuade old and new voters to support the CDU. If none of the twelve candidates wins 50 per cent in the first round there will be a run-off vote between the top-placed two candidates. There will be a series of eight regional hustings around the country from mid-November onwards to allow the candidates to present themselves and be questioned by party members. During this time, Kramp-Karrenbauer will step back from organising the election as party chairman and Thomas de Maiziere, the former interior minister, will take charge of the arrangements. Merkel is now a diminished figure with the latest national poll showing just 24 per cent likely to vote for the CDU. It is unlikely that she can stay in the chancellery for another three years under any of the likely party leadership successors, and in particular if either Merz or Spahn were to be elected as new leader of the CDU. ” It is unlikely that she can stay in the chancellery for another three years under any of the likely party leadership successors, and in particular if either Merz or Spahn were to be elected as new leader of the CDU.” I wonder. I am not up in CDU internal politics, but I suspect that if the leader is seen as being permanently at war with Merkel, this will not go down well with either the CDU or with the electorate at large. The new leader will have to find a way to present a fresh face and fresh ideas without trashing everything the CDU has done since 2005, but this should not be impossible. The wildcard in all these calculations is the SPD, which could force new elections on the CDU before the CDU is ready. The CDU will be hoping that the SPD’s current abysmal poll ratings will continue and will stop the SPD entertaining such an idea.